NE MLK and Morris – Garlington Center demolition and rebuild – 4 story and 3 story building with low income apartments and a larger space for programming. Huge parking lot that will equal the existing parking lot. MLK and Sacramento – 5-story 16 unit apartment building with ground floor retail. No car parking onsite. Market rate apartments on MLK – first in a while. 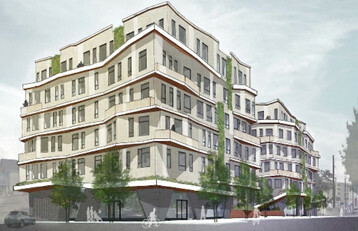 Proposal for apartments on MLK at Sacramento. 2405 N Vancouver- 5 story 54 unit apartment building over parking. 3116 N Vancouver- proposed 18 micro-unit construction project – appears to be stalled, house was repainted. No recent information. 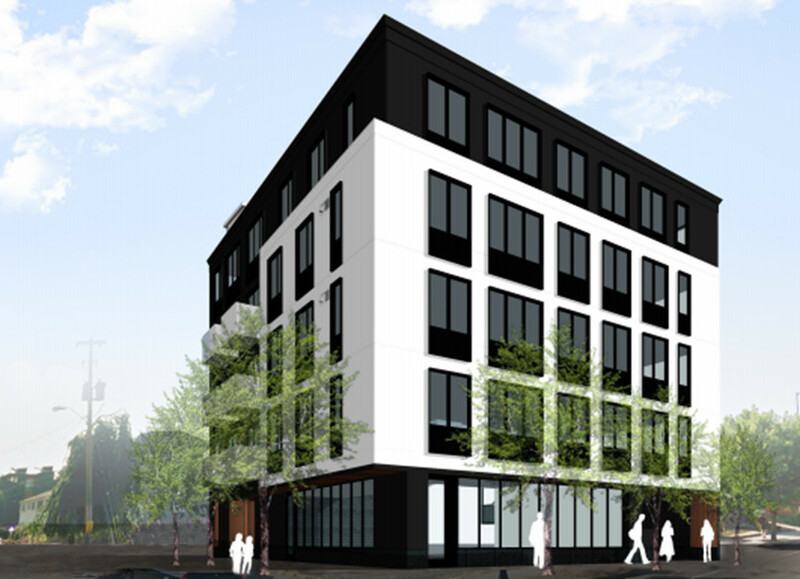 3138 N Vancouver – Strata by SolTerra – 95 units on a 6-story mixed use building. Some live/work space, 44 parking spaces and 144 long-term bike parking spaces. This lot is currently a grass field and part of the First Vancouver Baptist Church’s parking lot. N Williams and Fremont – Carbon12 – 14 high end condos ($1.5 Million each?) each with private elevator access over 1 floor of retail. 22 parking spaces and the tallest building not on Emanuel’s campus north of Broadway in Portland. This building would be Cross-Laminated Timber- one of the first in the United States. The Woods – SolTerra project: 50 unit mixed use space at Fargo and Williams. What does all of this development mean? The best indicator of where development will occur is where it is occurring right now. The Williams corridor is expected to continue growing. I hope this means that some of the vacant land on MLK, Jr Blvd will finally get built on and perhaps some of the auto-shops and car dealerships will relocate to the suburbs over time, although I am not holding my breath. Some residents are concerned that all of the new development we are getting is going to put a strain on the parking situation for the current residents. This may happen on some blocks, but there are some new tools that the city has recently come up with. If you want to get involved in starting a neighborhood parking permit system please contact the Land Use Committee, we haven’t found a champion in this area yet. One could be set up in South Eliot around the Moda Center impacted areas right now, but I don’t think critical mass has been reached in other areas yet. Another impact of all of this construction is that we’ll have more neighbors going forward. This means more energy on the streets and more wallets supporting local businesses. I, for one, welcome our new neighbors with open arms. Oh, and one more thing…….speaking of South Elliot…..It won’t be the Moda Center much longer. And quite honestly, if I hear the phrase, “going forward” or “moving forward” one more time, I will be afflicted with nausea…..
Give me a break!!! If you think parking is the only impact this surge in population is going to have on Elliot, go talk to the neighbors proximate to the development taking place around Division Street. Bringing this many more people into our neighborhood so rapidly, without addressing upgrades to an already ailing infrastructure is greedy madness! Period!!!! !